A strong record of working to improve our quality of life. Improving Education For Our Children – Ellen secured millions of dollars in additional State funds for Rockland public schools. She fought against the rapid implementation of the Common Core, new testing requirements and continues her opposition to the Gap Elimination Adjustment (GEA). She was successful in her effort to get a fiscal monitor for East Ramapo in 2104. Following the Greenberg report, the Assembly passed her monitor bill as recommended in the report. She continued working with SED to obtain further monitoring in the district. Fighting to Lower Taxes: Ellen Jaffee has a record of fighting against government waste and high property taxes. She voted against the MTA payroll tax and supported continuation of STAR. She is a strong advocate for real property tax reform and increasing government efficiency. Investing in our future – Promoting Economic Development – Ellen assured that Rockland was included in the state’s tax incentives for manufacturers. She also hosted Minority-and Women-Owned Business Enterprise (WMBE) forums to assist local small businesses. She sponsored legislation to preserve agricultural districts which are economic and environment resources. Creating Affordable Childcare – Ellen believes that affordable childcare helps create strong families and a stronger New York. She sponsored legislation to strengthen and expand affordable and accessible childcare. She advocated for funding for Pre-K and full day kindergarten. Ellen’s legislation assured that teenage children’s income would not be included in assessment for a childcare subsidy and continues efforts to expand child care subsidies. Protecting the Environment – Ellen’s record has earned her the endorsement of the New York League of Conservation Voters and the Sierra Club. Ellen actively opposes United Water’s desalination proposal; co – sponsored legislation expanding the moratorium on hydrofracking. Standing up for Seniors – Ellen sponsored legislation which expands eligibility for the EPIC program to assist seniors with the cost of prescription drugs and increased funding for senior community services. Reforming State Government – An advocate of a more open and transparent government Ellen has championed campaign finance and ethics reform. Fighting for Women’s Equality – Ellen was a leader in the Assembly passage of the Women’s Equality Act (WEA). She is the prime sponsor of Women’s Pay Equity legislation and the “Boss Bill” which would prevent employers from discriminating against their employees for their reproductive health-care decisions. Making Lives Safer – Ellen fought to increase criminal penalties for hate crimes, crimes against seniors and domestic violence. Concerned about over the counter drug abuse among our youth Ellen passed legislation which requires a prescription to purchase cough medicine containing DXM if you are under 18 years old. 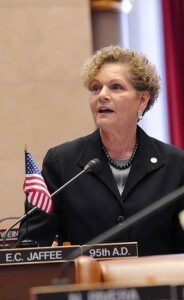 Advocating For Social Justice – Cosponsor of legislation halting solitary confinement as well as supportive of banning the box legislation. Ellen also believes NY needs to step up and raise the age of criminal responsibility like all other 48 states.